On one of my last trips through Winkler, Lori thought I needed a pack of these gold foiled cards….all different patterns and designs. She was right. She usually is on these matters! I finally got to play with them this last week and this is the fun I got up to! I also took the opportunity to pull out my “leftovers” dish of embellishments previously pulled out or created for some other project and didn’t end up getting used. I spread all the cards out on the table and just began sifting through my leftovers dish. Because they were all out in front of me, all of the cards got treated much the same, for a somewhat unified look, even though they are for all occasions. I just started dropping items here and there, and then switching them around and piling them up. Die cut ephemera packs are great for that! I combined these sentiment dies cut from gold foil cardstock, with stamped and heat embossed words and phrases. I also took the opportunity to use UP some old Prima flowers. Those Teresa Collins ephemera packs are the bomb dot com, I tell ya! There’s something for everyone in them! I also used some stamped, colored and “painted” leaves and flowers from last year when I demo’ed the Prima pencils at the Spring Crop. The final touch was to add some bling. Pearl dots or rhinestones. I love how the overall similarity between the cards makes them a great-looking set to give as a gift pack. As you can see, there is a ton of variety in the card pack letting you take your creation in any direction and finish them off as ornately or as simply as you like! Thanks for stopping by today! I hope you make some time for yourself to create something pretty!! As I get older, I am realizing that it is the little things that make a life special. I am a labour and delivery nurse by day, and by night for that matter! It is easy to get caught up in work and overtime and live for just that. The gjrls at work make special effort to get together and do things outside of work. It is these little events that create memories. This beautiful lady is my friend Sue from work. She is retired now so I don’t get to see her very often and when I do get to see her it is a special time. I decided to scrap one of those special times. 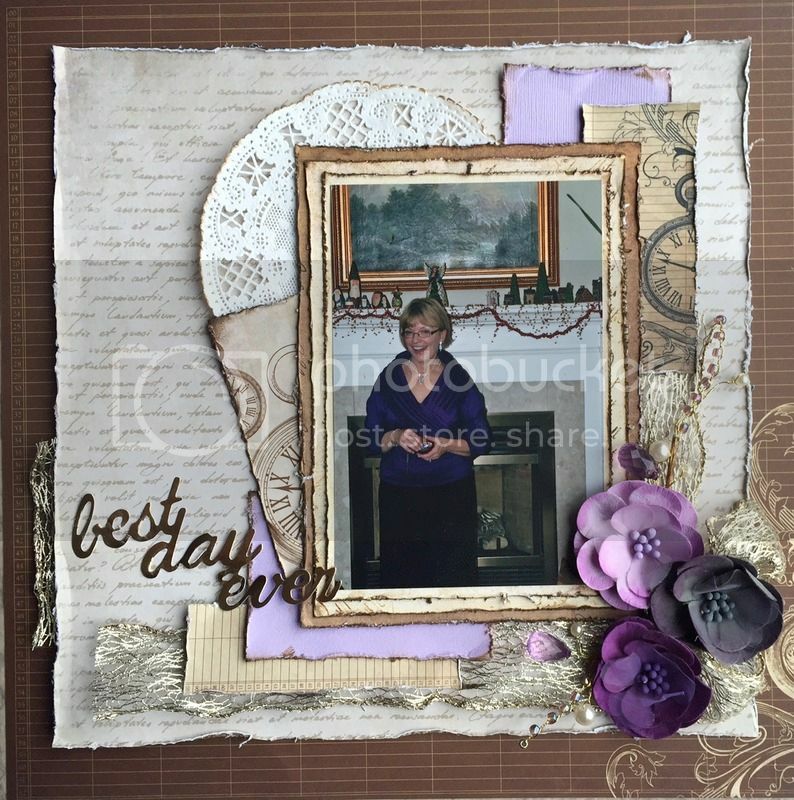 I used Kaisercraft Betsy’s couture collection. I distressed all the layers and inked them with the new ground expresso colour from Tim Holtz. It is very dark, but works well for this use in very small amounts. I added some plain purple cardstock and some metallic ribbon I still had from my daughter’s wedding. The Bo Bunny flower cluster is simple but elegant. I like that ombre colour palette. I make 2 loops of the metallic ribbon and tucked them into the flower cluster. The pearl and purple bead accents used add a little unexpected elegance as well. The title is from My Mind’s Eye. I encourage you to scrap your special little moments. I promise that when you look back on the layouts, it will bring a smile to your face.